I got this shot when I was hunting for datacrons with Tiger's slinger Lyell. Somehow I really like it. My twi'lek is just walking away on this strange tilted platform, but seems to hesitate when good-looking Lyell comes running towards her from the opposite side. "Wait!" There's this tension as if a story is just about to unfold. Or probably that's just my overactive imagination. 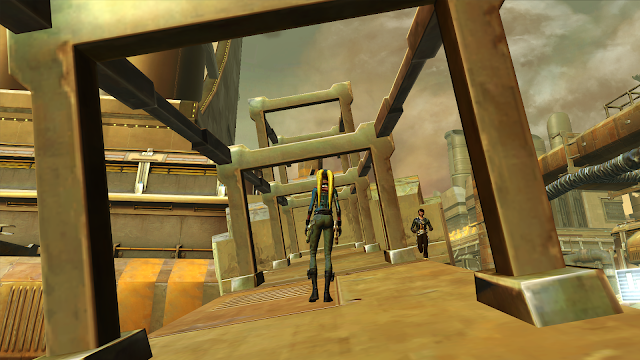 Although I'd imagine it more as Lyell running away from some disaster (it looks like there is a small fire in one of the buildings on a quick glance) and you twi'lek is just calmly walking into danger. Or vice-versa. Maybe your twi'lek just detonated something big off-screen and Lyell was in the area, heard the explosion and is running there to see what happened. So many possibilities! You managed to capture it with words way better than I, as usual! Those are great suggestions. I love it when pictures look dramatic while there isn't actually anything happening. It makes you wonder. LOTRO: Should you pre-order Helm's Deep?